As some of you may be aware, we in Boston are currently in the midst of some full blast Winter worthy of the Frozen North. I decided to spend a portion of the snowbound day (the part not spent consuming brandy, Guinness, and beef stew) performing a bit of cosmetic surgery on an old coat. I've had this old Brooks Brothers duffle coat for a few years now. Originally picked up at a thrift shop (of course) for $12.99, it quickly became a favorite. I wear it a lot with jeans and sweaters, and over preppier jacket and tie combos involving tweeds, blazers, button down oxfords, cords, et cetera. The blanket lining keeps me warm, and the brownish shade of tan works well with anything. The only thing I never liked about it was the leather thong toggles and silly plastic "teeth", but I could live with it. But a real duffle coat ought to have rope and wood toggles. Fortunately, replacement sets can be ordered from Gloverall, the English manufacturer of these coats, for less than $10. I ordered a set over a month ago, and it arrived in short order. In the package are eight pieces of jute rope and four wooden toggles. 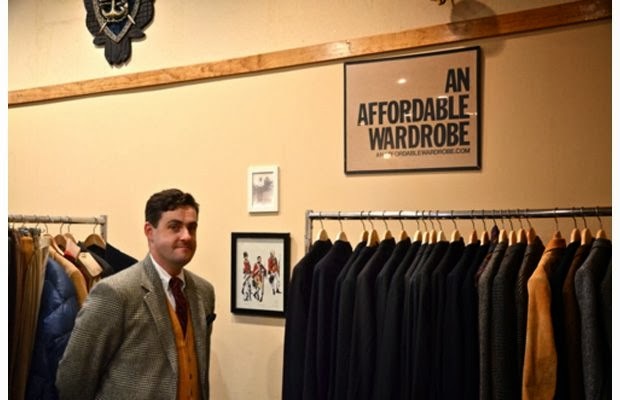 I had hesitated about bringing the coat to the tailor to have the new toggles put on, mostly because I didn't want to be without the coat for a week or two in the middle of Winter. Then today we were snowed in, so I decided to have a go at it myself. The fist thing to do is basically assemble the toggles. Each wood toggle is wrapped in jute rope which I then sewed tightly in place. The remaining four pieces of jute were sewn into loops. When doing this step, make sure to leave the loops wide enough to easily accommodate the wood toggles when fastening them. Next, after carefully removing the old leather thongs with a seam ripper, I sewed on set on partially to insure that I had the placement correct. In order to keep things neat, I made sure to stitch through the ghost of the stitch marks left by the original thongs. Then I tacked down the other end and trimmed off the excess jute. Repeat with the rest of the toggles.I set the project aside a few times to do other things, but all told the entire process took little more than an hour. In the end, I find the coat to be vastly improved. It's a small detail, but an important one. No doubt I've gotten my $12.99 worth out of this coat in the last four years, and with these new toggles it will last for many more to come. Sometimes the best new coat is your favorite old coat. For the last few years, I have been happy to attend a Robbie Burns Supper at a club in Boston at the invitation of a good friend. 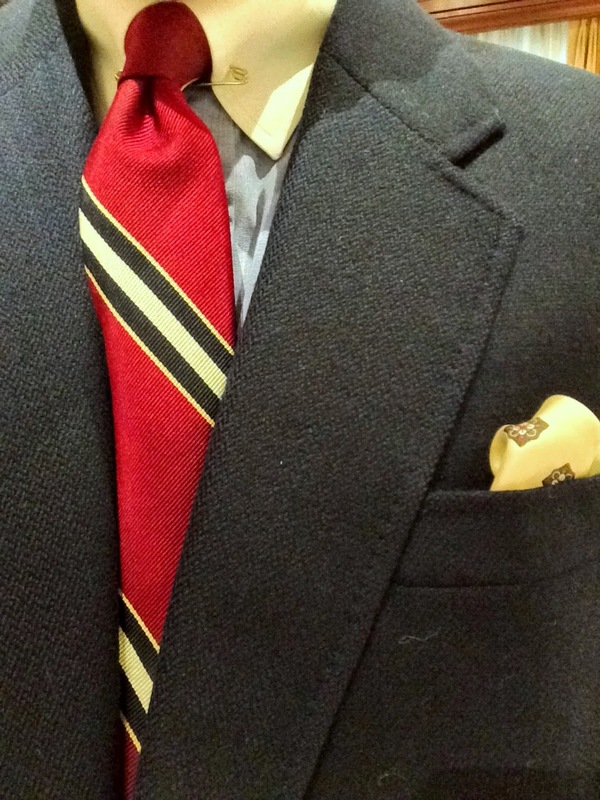 I've worn a suit of Black Watch, and tuxedo with a Royal Stewart blazer swapped in for the standard diner jacket. This year's supper was held last Friday, but I wasn't sure if I would attend. Then only last Wednesday, I found the above jacket, at a thrift shop of course, for a mere $7.99. A dinner jacket in Dress Gordon, with broad silk faced shawl collar and silk edged pockets, likely 1940s vintage, in excellent shape, and exactly my size. Rendered in old Viyella. Honestly, a tartan dinner jacket is one thing, but a Viyella dinner jacket?!?! Unheard of. Just in time I guess. In the end, I didn't go to Burns Supper this year after all, opting instead to end a long day of hard work and ring in the weekend with a pizza dinner with the wife and kids. But Scots Wha Hae and all that nonetheless. p.s. I have some great new listings on ebay, ending next Sunday, 1 Feb. Check it out. Regular readers of this blog know that the answer I would give to the question posed in the title of this post is emphatically to repair...most of the time. It's fair to say that tassel loafers are my favorite type of shoe. I suppose that's why I've been able to justify owning five pair that vary only slightly from one another. About six months ago, an old favorite pair suffered irreparable damage to the leather upper. I wore those shoes with cords and sweaters, flannels and tweeds, and in violation of barely existent sartorial rules, even suits. I was happy to have scored an apt replacement in the form of the above pair of Allen Edmonds in the "Saratoga" model, via eBay for $26. But these weren't an such an apt replacement. There were too many differences.The vamp on these is much higher, and the toe is a little pointier than I like. Still, I could overlook those things. What I had trouble overlooking was the tassels. On my old pair, the lace was actually tied in a knot, but on this pair, the tassels were just attached separately. A small detail, but a detail nonetheless. It's kind of like getting cheap boat shoes where the lace doesn't really go around the whole shoe. Add to that the fact that the previous owner had applied (badly) way too many layers of wax polish. Probably read too many #menswear blogs. Consequently, they get much less use than their predecessors. So when they got a little worn in the heel and needed new soles, I stalled. I considered bringing them to Allen Edmonds for re-crafting. I've seen re-crafted Allen Edmonds shoes firsthand, and I know that the service is worth the $100 or so dollars it costs. They would fix the soles and strip off all those excessive layers of wax polish, but those damn "fake" tassels would still be there. Then these came along, Italian made for Polo Ralph Lauren, in barely worn condition, for $60 via eBay. The vamp is lower, giving the shoe a more slipper like line, which I like. They have a closer shape to the beloved pair I tried to replace in the first place. The toe is rounder, which accommodates my wide, brick shaped foot better. And they cost about half of what the re-crafting process would cost. Best of all, the lace is tied, and braided to boot. A zesty little touch. I can already tell that these will get easily double the wear of the previous pair. Given that they saved me money, this is one case where replacement was a better choice than repair. Better to spend those re-crafting dollars on these Allen Edmonds shell cordovan "Mac Neil" longwings, which also need soles and heels. These are not so easily replaced, at least not at the kind of prices I'm used to paying. Repair and reuse may be the cornerstone concepts of thrift itself, but they are best tempered with a well timed and occasional replacement. Allow me to apologize for the blatant cell phone photography. Not up to my usual standard, but until I get this blog up to something like full speed again, we'll have to take what we can get. Back in October, I happened to stumble across a pair of cream colored heavy flannel trousers in a thrift shop, for less than $10. Nice as they were, I didn't really have any need for them. If we're being totally honest, in modern times the idea of having a "need" for something like cream flannel pants is downright ludicrous anyway. 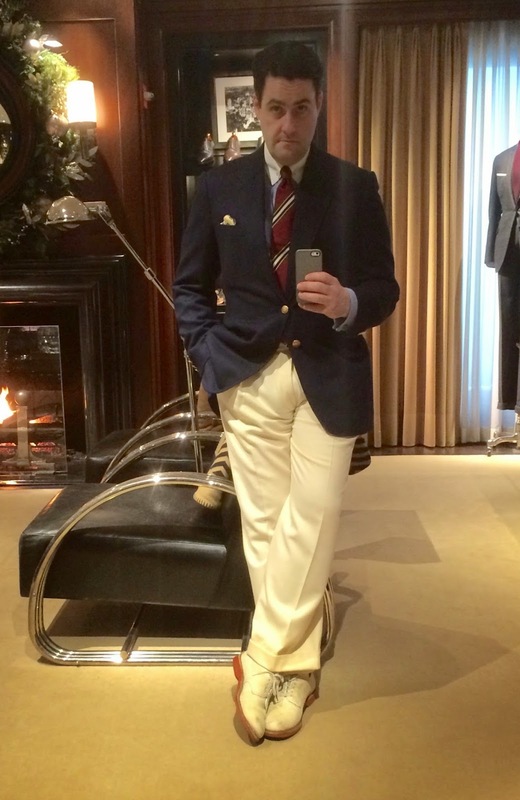 Still, not two weeks after finding them I was to attend an event at Ralph Lauren in Boston for the release of the more than a little preposterous coffee table book "Rowing Blazers", and the invitation specified "regatta attire requested", whatever that means. So I now had an excuse. Score one for justification. So with the event now behind me, what to do with the silly pants? Wear them, I guess, in January. And so unfolds my first foray into winter white. The pants are hey-day era Polo, with a high waist, deep forward pleats, brace buttons, full cut legs and big cuffs. If you're going to wear pants like this in the modern world, you'll have to adopt something of a spirit of "go big or go home". 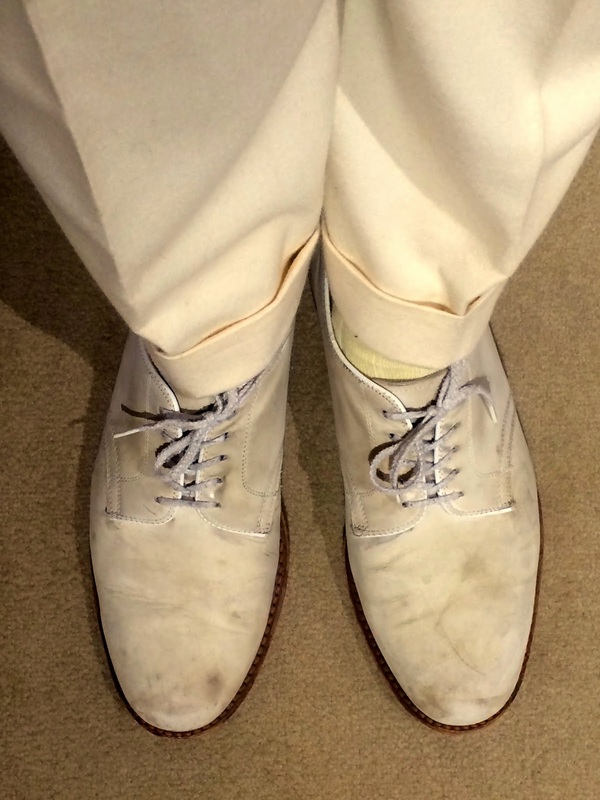 To that end, dirty white bucks, with cream yellow socks,seemed the only logical footwear choice. Going "all the way", as the kids say, I topped the whole thing with a Polo polo coat, floppy tweed cap, and vintage inspired sunglasses. Sometimes it's fun to go to the hilt. Of course, it helps if you work in an environment where this sort of thing is somehow acceptable. True, I have argued against the dangers of treading the fine line between wearing vintage and dressing in costume, and this time it's likely that I crossed that line. Funny thing is, even though this outfit screams of the 1920s, and every piece of it is second hand, none of it is actually all that old. I guess that speaks to the real meaning of "classics" in menswear. In the end, the cream flannels may have been too much of a conversation piece, even for me. 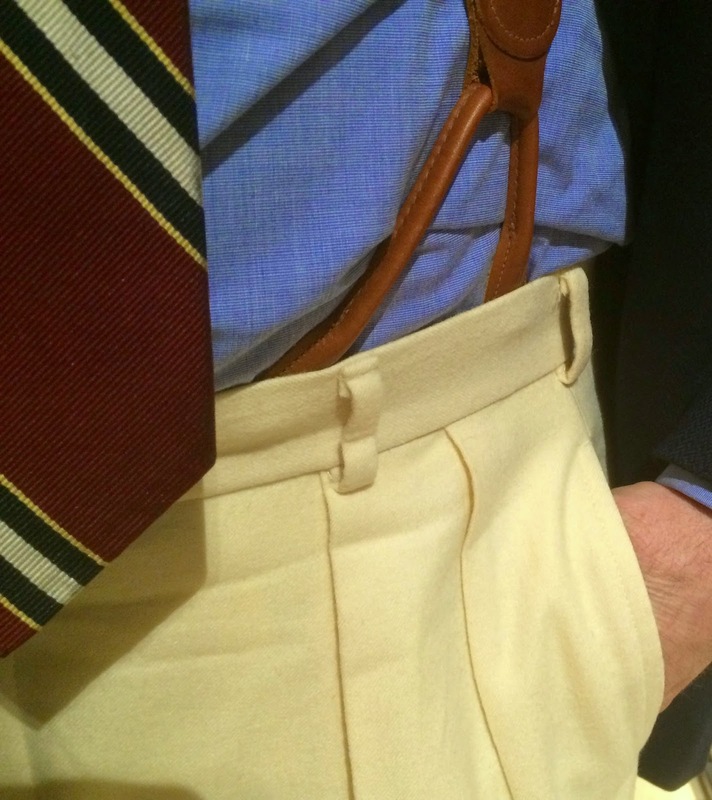 The last thing a gentleman wants is everybody talking about his pants, or something, right? On the other hand, go ahead, I dare you. To begin, let me say that I have missed this place. I miss sharing my thoughts on matters sartorial and other tangential subjects however loosely related, and I miss hearing from you, O Dear Readers. What I don't miss is feeling beholden to this blog, periphery commercial interests, or for that matter the Internet in general. So without further ado, let's get back into it, as the kids say, albeit on more casual terms.Back when I announced my self imposed indefinite hiatus, I figured I would come back one way or another, I just wasn't sure how, or when. Then, a couple of weeks ago, I made an eBay purchase that was such perfect AAW fodder that I couldn't resist. Pictured above is a massive piece of thorn proof tweed from the Andover Shop. I saw this gem listed on eBay for a mere $15. The listing had terrible photos, and stressed the "as-is' nature of the potential purchase. Given the fact that thrift shopping is always something of a gamble, and given the extremely low ante on this item, I decided there was little to lose. Back in 2010, I found a very similar jacket at a thrift shop (of course). 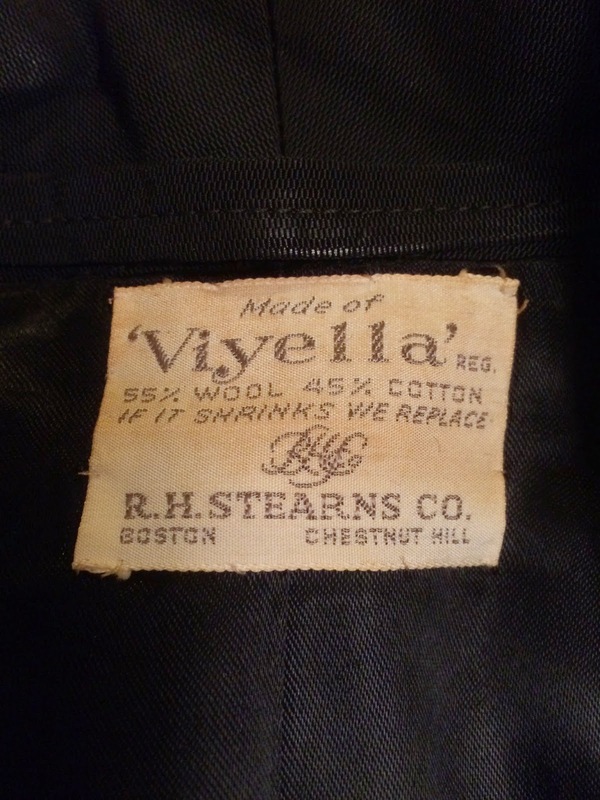 It was an exciting find, a real rare treat, and I wore it as often as anyone can wear a super thick English country tweed indoors in the United States in the modern times. But I decided to sell it. Maybe it was in a fit of closet cleansing...maybe it was because I felt (as usual) that I had more clothes than decency would allow one man...maybe it was in a moment of wanting "the money" more than the jacket...or maybe it was because my then new business selling fine vintage and second hand needed the credibility that something like this would give it. I don't really remember. What I do remember is the deep pang of instant regret I felt as I taped up the box and sent it out. So four years later, I found what appeared to be the same jacket on eBay, for wicked cheap. When the box arrived, I vaguely recognized the name on the return address. Not only was this the same jacket, it was actually the very same one I had sold before. Thornproof green tweed jacket with bold orange check, via the Andover Shop, via the Salvation Army, via An Affordable Wardrobe, via eBay. The circle is complete. "I Will Do It The Old Way..."
For as long as I can remember, I've been taking my shoes to Savas Shoe Repair to be revitalized by the expert hands of Artsroun Apinian. Sadly Mr. Arpinian passed away this week. I considered him a friend, and despite this blog being on hiatus just at the moment he deserves some space here. 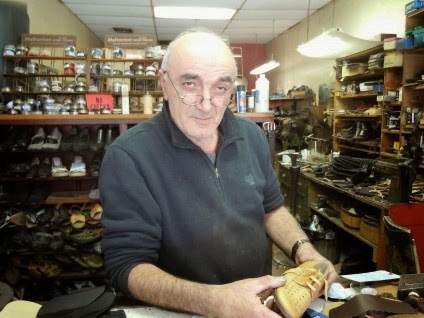 Mr. Arpinian was an old world cobbler the likes of which rarely exists anymore. A true master of his craft, his work was nothing short of art. His shop was tiny and reeked of shoe polish, and every inch of the place was piled high with shoes and sheets of leather. I never got rid of a pair of shoes without consulting him first. He really loved his work, and the better the shoes were to begin with, the more involved he would get. A long winded talker, he loved to explain to you in great detail exactly what made the shoes good, and exactly how he intended to repair them. "These shoes need new heels. I will do it the old way...with nails." And he did, every time. But it was more than that. After talk of the shoes was finished a friendly and often long conversation about just about everything else always ensued. A trip to his shop just to pick up a finished pair could easily last a half an hour. The shop is still open, and his son has taken over. It;s heartening to see the place still open, since a good cobbler is a precious commodity these days. I haven't brought anything for repair yet, but if he learned from his father then that's a point in his favor. Rest well, Mr. Arpinian. My shoes and I will miss you. By now you've noticed that posting around here has ground nearly to a halt. Some of you have even been kind enough to email and make sure all was well on my end. It is, thanks. Allow me to give a brief explanation of what to expect from the AAW you know and love in the near future. 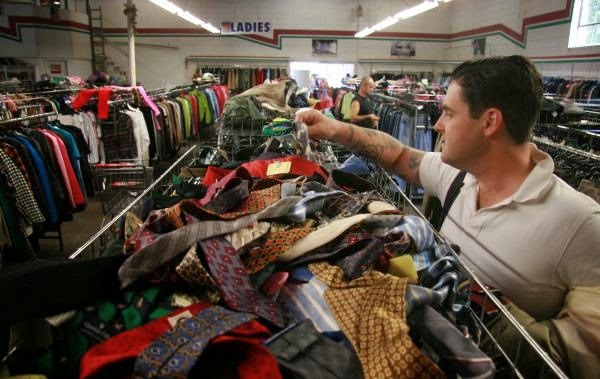 I've been writing this blog for just over six years now, since September of 2008, and it's been great fun for the most part.When I started, I felt that the then burgeoning #menswear blogosphere phenomenon needed a cheapskate's voice, and I voluntarily stepped into to fill that role, having honed my cheapskate skills over a lifetime. What I didn't know then was how much I enjoyed sharing my thoughts in writing. I turns out I do, a lot. I spent many years previous performing in bands and had to give that up when my children came along. I guess I didn't know how much I enjoyed having an audience either. Writing this blog has brought many surprises into my life. I launched a business based on my yammerings here. Every now and then, somebody sent me some expensive thing for free, which was also nice. But best of all, I've met more than a few people who will be lifelong friends through this shallow little pursuit. Who knew? In any case, after six years I find myself running out of things to say here. Add to that the fact the since August ehow.com has actually been paying me (imagine it) once a week to write for them. All this has been making it increasingly difficult to regularly deliver what you've come to expect here, and so rather than churn out pointless posts just to keep the page fresh, I think it's high time to take a rest and collect my thoughts. I'll still be active over at tumblr if you really need a Giuseppe Timore fix. I enjoy blogging and hope to get back into soon, with a new approach and some fresh ideas. 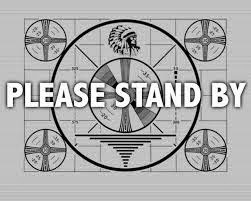 Until then, please stand by. p.s. an excellent new employment opportunity looms on the horizon, and as such I will sadly have to shutter the AAW brick and mortar "secret store" in the coming weeks, moving business back to online only. As such, everything in the store, both physical and online, is 25% off until further notice, Use discount code THANKYOU25 at checkout.